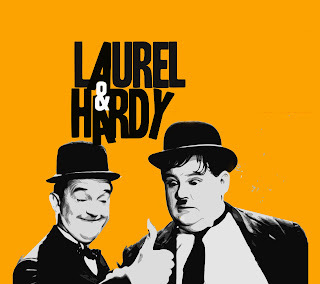 This Autumn one of comedies most loved, admired and prolific duos will be reborn at York Theatre Royal, as Laurel & Hardy take to the stage as part of the Theatre’s In The Round Ensemble Season from Fri 21 Oct to Sat 5 Nov. Including some of their best comedy routines, musical numbers, dance and slapstick, this two-man production written by Tom McGrath allows the audience to relive Laurel & Hardy’s finest hours. Take a trip with Stan Laurel and Oliver Hardy as they look back at their lives and loves offering fascinating insights into rarely seen off screen relationships and personal heartaches. Their charm and wit will be recreated for audiences in a warmly affectionate homage to one of comedies most successful double acts. Starring York Theatre Royal Panto favourite Martin Barrass (The Wind in the Willows, The Crucible, My Family & Other Animals, Peter Pan, Forty Years on) as Stan Laurel, and stand-up comedian and Theatre Royal newcomer, André Vincent (The Late Edition, Waiting for Alice) as Oliver Hardy, the show follows the pair stuck in a waiting room somewhere between death and eternity. Before passing through into the next world they must relive some of the greatest and painful moments of their lives. Writer Tom McGrath (The Hard Man) delves deep into the personal experiences of the pair rarely seen by audiences, however still capturing the visual slapstick humour by this much admired duo. Directed by York Theatre Royal’s Artistic Director Damian Cruden (The Railway Children), this hilarious script combined with a charm and wit only Stan and Ollie can provide will be brought to life for an unmissable night at the theatre. Live piano music will also be composed and played onstage by Christopher Madin. This immensely talented musician, who composed the score for the Olivier award winning ‘The Railway Children’, will accompany our talented twosome throughout. This will add another impulsive and sometimes improvised element to the comedic caper. The theatres new configuration of In the Round will thrust audiences into the heart of the action enabling them to join in with the laughter and despair as the duo journey through there eventful relationship and prolific career. To book tickets call the Box Office on 01904 623568 or online at www.yorktheatreroyal.co.uk.